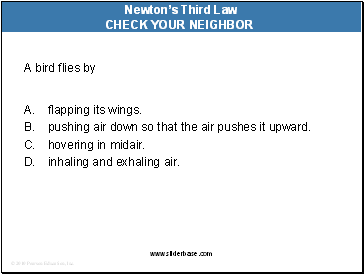 Consider the same system, but with external force of friction on it. 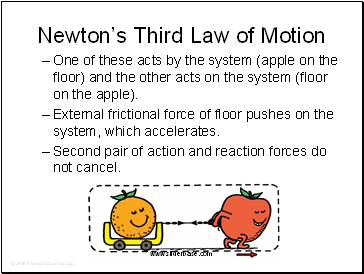 Same internal action and reaction forces (between the orange and apple) cancel. A second pair of action-reaction forces (between the apple’s feet and the floor) exists. One of these acts by the system (apple on the floor) and the other acts on the system (floor on the apple). External frictional force of floor pushes on the system, which accelerates. Second pair of action and reaction forces do not cancel. pushing air down so that the air pushes it upward. 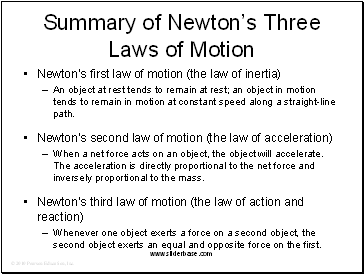 An object at rest tends to remain at rest; an object in motion tends to remain in motion at constant speed along a straight-line path. 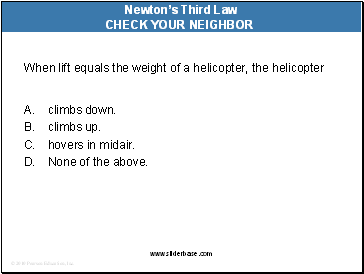 When a net force acts on an object, the object will accelerate. 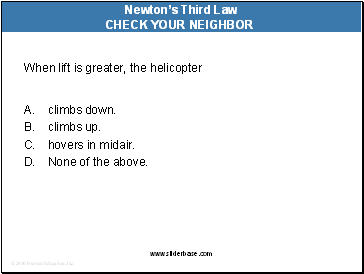 The acceleration is directly proportional to the net force and inversely proportional to the mass.